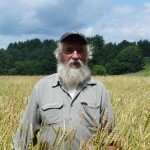 Below you’ll find an historical background on grain production by Jack Lazor of Butterworks Farm. The story of grains in Vermont must begin with the “three sisters” crops of corn, beans, and squash. Archeological evidence from the Skitchewaug site on the Connecticut River near Springfield, Vermont reveals that these crops were first cultivated around 1100 A.D. The Woodland Abenaki began to supplement their hunter-gatherer diet with cultivated crops around this time. Corn and bean culture came several centuries later to the Champlain Basin because game was more plentiful and easier to procure in a broader and less challenging landscape. The Donahue site at the mouth of the Winooski River on Lake Champlain saw its first agriculture beginning in 1440. Flint corn, squash, and kidney beans were grown together in mounds by the women of the tribe. Just about all Native American agriculture was practiced on alluvial soils at the deltas of Vermont’s major rivers. When the fertility declined, cultivation was moved to new spot. Vermont’s first white settlers came from opposite ends of the territory. The French worked their way southward from the Richelieu River down into Lake Champlain building forts at Isle La Motte and Crown Point, settling the land in seigneuries, long narrow strips with frontage on the lakeshore. The English constructed Fort Dummer, southeast of Brattleboro in 1724. The British land tenure style concentrated on large rectangular fields with several crops in rotation War between the French and English in Europe and North America as well as hostile raids from displaced Native peoples held back the advancement of settlement until the Treaty of Paris was signed in 1763 and British took control of northeastern North America. Until this point, subsistence farming had been the order of the day. Corn, beans, wheat, rye, barley, oats, and flax were all grown for home use. Vermont’s first wave of settlement began in the 1760’s as newcomers made their way up the Connecticut river valley and followed the Crown Point military road to the Champlain lowlands. A second, larger group of Revolutionary War veterans arrived after 1790 in search of new land grants. It soon became apparent that wheat grew quite well on these newly cleared acres. Wheat had done quite poorly in southern New England and had been replaced by rye as the chief cereal crop. The highly fertile clay loams of the Champlain basin, coupled with a perfect climate produced prolific crops of very high quality wheat. By 1800, Vermont had become a major exporter of wheat. Stories abound about twenty to thirty bushel to the acre yields and people paying for their farms in one year with wheat. Within twenty years, yields began to decline as soils became exhausted from the continuous cropping of wheat. Wheat crops were totally devastated by the wheat midge two years in a row in the 1830’s. Vermont soon lost its breadbasket status after the Erie Canal was completed in 1825 and the center of wheat production moved to the Genesee Valley of western New York. As worn out soils grew back to grass and pasture, sheep farming soon became the order of the day. Favorable tariff legislation in 1828 gave American produced wool a distinct advantage over British imports, making sheep farming much more attractive. Wheat production peaked in Vermont in 1840 at 644,000 bushels. By 1850, total harvest was 535,955 bushels. Thirty years later, the Census of Agriculture tallied wheat production in Vermont at 337.257 bushels. Wheat continued to be cultivated for family and local consumption on small hill farms all over the state. Census records indicate that two acres of wheat were cultivated on my farm in 1880. The yield was fifteen bushels to the acre. By the turn of the century, total statewide production had fallen to 34.650 bushels. A very brief nationwide boom in the cultivation of wheat occurred just after World War One when crops failed in the Russian Crimea. Vermont production climbed back to 176,003 bushels in 1919. Wheat has never really died out as a crop here in Vermont. As late as 1950, over 900 acres were reported to the census. The Vermont grain story will continue in our next issue.